Hey Y’all!! Katie at Peach Creek Ranch, here. I hope y’all are staying cool in this SAUNA of a state we call Texas. It might be hot in this Texas summer, but the love of our PCR couples burns even hotter! I know, so corny. I just had to! The show must go on, and we have so many amazing ways to beat the heat at PCR! We just recently debuted our option to add-on Sun-Brellas down by the ceremony site to give your guests some reprieve from the sun, as well as our amazing pavilion by the water which many brides are opting to have their ceremonies under. You can even have an indoor ceremony in front of our gorgeous barn doors, and our staff will do all of the leg-work at no extra charge to reset for your reception. That’s right, we are just THAT awesome! Enough small talk about the weather, I’m here to discuss something else that makes Peach Creek Ranch a one-of-a-kind wedding venue: our 48-Hour Wedding Packages. Many brides never even consider a weekend-long wedding celebration. The most commons reasons are that they think a half-day rental will be plenty of time, or that it would be too expensive to find a venue for a weekend-long experience. And yet, our trademark 48-hour wedding package has quickly become our most popular option! Our PCR brides love how our full-wedding weekend package gives them the most bang for their buck and allows them the flexibility to create the wedding of their dreams (not to mention relax and enjoy their wedding day!). Today, we want to share the top reasons why our 48-hour Wedding Package is the best bang for your buck - and why it is the most popular option for our brides! Think of all the time that goes into planning your wedding - all the boards built on Pinterest, details perfectly put together, all of the DIY projects, vendors booked, centerpieces planned, EVERYTHING! That is just the tip of the iceberg. Now, picture bringing all of these elements together in just a few hours on the same day that you will you walk down the aisle to the love of your life! These two happenings just do not go together. You should be drinking mimosas, hanging with your best gals, getting pampered all day and mentally preparing yourself for this momentous occasion that will take place that afternoon. This is why the day before is so important! Because our 48-Hour Packages span from the day before your wedding at 10 AM to the day after at 10 AM, you can get all of those details out of the way and focus on the most important thing on the day of, your marriage! The day before at 10 AM our brides and grooms arrive and go to work. They arrive to their tables and chairs already set up in their preferred floorplan and they set linens, create floral arrangements, place seating cards, set up their tables, firm up any last minute details, fold napkins, or if they are the lucky ones they just spend all day watching other vendors do these things for them - no judgement here, y’all! Whatever you choose to do with this time, you have a ton of freedom and flexibility, so that you can enjoy and relax on your wedding day! For control freaks like myself, this one is especially important. If you get a single day package at any given venue, they are very likely to have a wedding booked the day before. This often means that you are not granted a guaranteed rehearsal on-site - and unfortunately, many brides never realize this before booking their venue! For ALL of our 48-Hour Wedding Packages, you have the night before to get down to business and get all of your ducks (groomsmen) in a row and put your mind at ease by rehearsing your ceremony the night before - without all the “day of” jitters! Then (for no extra charge of course!) you are welcome to host your rehearsal dinner at PCR. This is just another reason why the full wedding weekend really is the best bang for your buck! We will take care of the tables, chairs, all your trash pickup, and even play some tunes through our speakers for you as you let off some steam with your closest family and friends before the biggest day of your life thus far. All your setup is already complete, you rehearsed and walked the walk, now just to party at the party with the best of them! The things you DON’T need to worry about? No need to worry about getting all those people from the rehearsal to dinner - it’s all in one place! No need to pay extra for another space to host your rehearsal dinner or food and beverage minimums at restaurants - get it catered at PCR! No need to limit the amount of guests you can invite, spend time with all your favorite people! No need to worry about drinking and then having to drive - interest peaked? Read on, curious one! In both of our 48-Hour Wedding Packages two nights of lodging are included for 34+ guests! This would cost a fortune at any reasonable hotel, and you would still have to coordinate getting to and from the hotel, creating more stress and money spent for your loved ones. Instead, when you choose our 48-hour package, your closest family and friends can enjoy a weekend retreat at Peach Creek Ranch for a full 48 Hours! This could be whoever you choose it to be, your parents, bridal party, out-of-town guests, whoever! This lodging includes our cottages, and our barndominium. Condo + Barn = Barndominium. I promise it’s much more Joanna Gaines and much less backwoods than it sounds. This “barndo” is 7 bedrooms, 5.5 baths, has a plethora of king sized beds, quality mattresses and sheets, open floor plan, fenced in backyard (bring those pups!) and all the comforts of home in a clean and bright rustic-chic setting. Not to toot our own horn, but it’s pretty awesome. This ensures that your best guys and gals can bunk up a few steps from the venue and have a home base for the weekend. You can keep tabs on your bridal party, cook breakfasts and lunches in our huge kitchen, cuddle up on the comfy leather couches with your future spouse, and breathe a huge sigh of relief that going to and from a sterile hotel room all weekend is not on the docket. The Wedding Day: THE BEST DAY EVER! Picture this. You made it, and you did it in style! You saved money by setting up your wedding your own wedding the day before, you got the reassurance that you needed at your on-site rehearsal to ease your nerves, you partied like a rock star the night before with your closest family and friends at your rehearsal dinner, and now you have nothing left to do on your wedding day but take care of yourself. This is the most refreshing feeling in the world, especially on a day that has been such a long time coming and so many thousands of dollars in the making, you DESERVE this feeling! This is one of the biggest appeals to having a 48- Hour package. 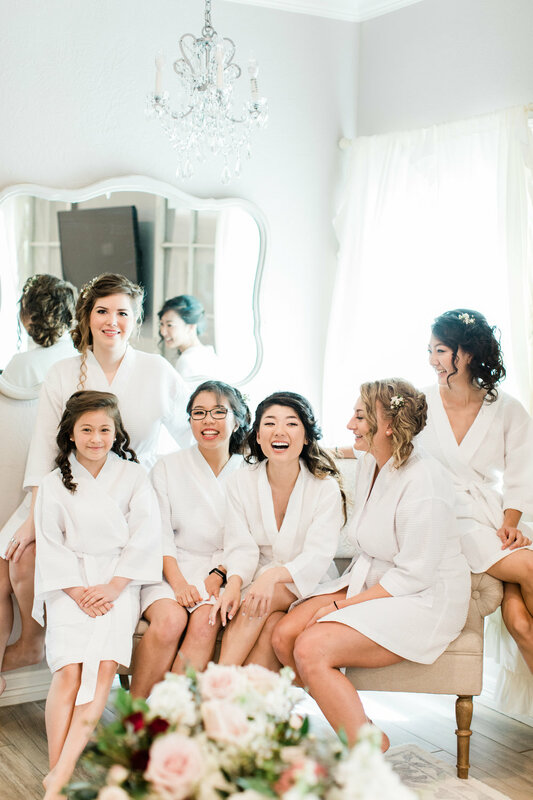 You can go to breakfast with your bridal party, get pedicures, have your hair and makeup done in our bride’s cottage, whatever your fancy. 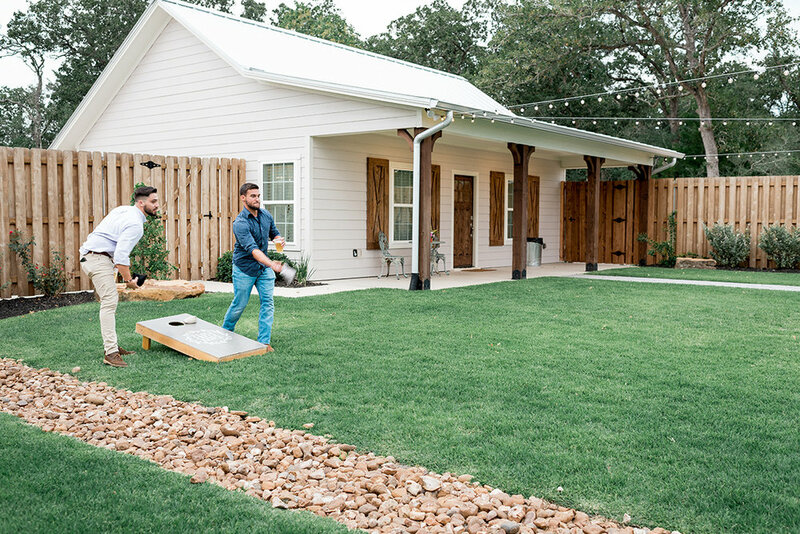 Your groom can go have a guy’s day with his buddies, whether that means golfing, lunch at the local brewery, or fishing in our stocked pond. He’s free to do whatever he wants to do to make this memorable day even more memorable! Our coordinator will lead the way and make sure that all vendors arrive in a timely manner, and at the end of this magical day you can retire to your cottage and let us do the heavy lifting. We will tear down all the personal décor that you set up, place it in one easy to reach location, so you can enjoy the rest of your wedding night without placing the burden of cleaning up on friends or family. 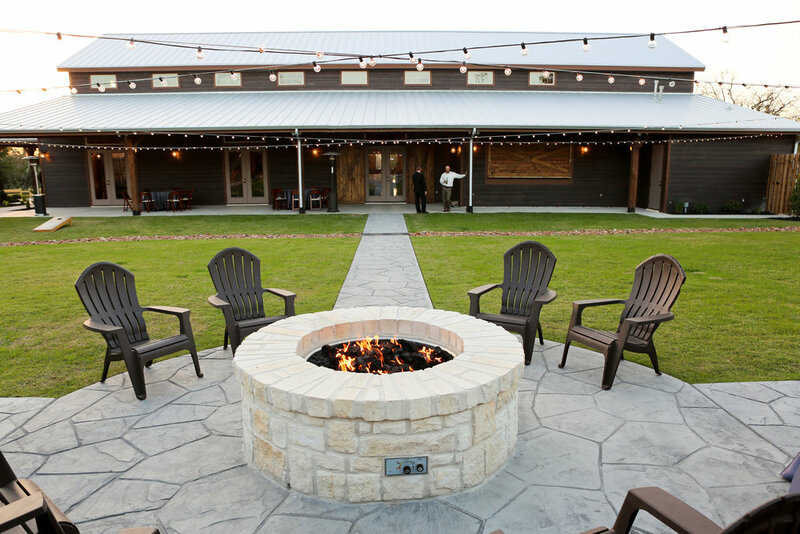 Hang out by our fire pit, play some late night board games under the courtyard string lights, or have a little after-party at the barndominium. Peach Creek Ranch is your home for the weekend and we fully intend it to feel comfortable and relaxing for you and your guests. 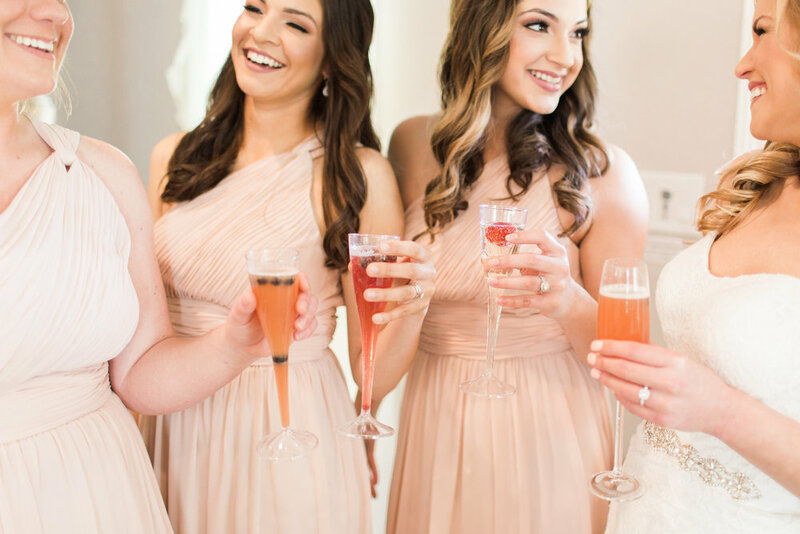 This isn’t something that is exclusive to our 48- Hour Wedding Package, but it is worth mentioning that the ladies of All Things Planned play a huge part in making your day as stress- free as possible. They do play a larger part in our 48–Hour packages because they will be leading your on-site rehearsal the day before your wedding and instilling nothing but a “we got this” vibe with every move they make. You will have an assigned coordinator 6 weeks out from the wedding and they will create a timeline, floorplan, be the point of contact for all of your vendors, and will basically be angels in disguise on your wedding day. They have years of experience and have coordinated over 130 weddings at our venue. They know Peach Creek Ranch better than anyone and that makes a huge difference when making your day the best it possibly can be. This day-of-coordination package is valued at over $1,500 if contracted directly from ATP, but is included in all of our wedding packages at Peach Creek Ranch! If you need a little more help with planning, setup, or even just cutting the cake, you can add-on additional services through ATP. Being a PCR bride, you will receive a credit for any more intensive packages that ATP offers such as their Partial or Full Planning Packages, which start further out than 6 weeks from your wedding if contracted. Either way, you will be in the most capable of hands with this amazing company and their lead coordinators. Our 48-Hour Packages are stress-free and will ultimately save you money with all the extras bundled into them. The lodging keeps your besties on-site (close to the action, without drinking and driving) and is much cheaper than the equivalent of hotel rooms for 34 people. The full 48 hours of rental allows extra time for a DIY setup (no need to pay someone else to do it), a guaranteed rehearsal, and a rehearsal dinner without incurring extra restaurant or event space costs. Our INCLUDED coordinator that knows our venue better than any individual in the business saves you the time to research finding your own, as well as the cost of hiring an outside coordinator. All of these things will save your money and your sanity in the long run. Weddings can quickly become expensive, stressful, and often go by way too fast. Let us help out by offering you a weekend getaway with more time to spend with family. Allow us to take away your worries with a coordinator and give you enough time to eliminate any “rushed” feelings the day of your wedding. 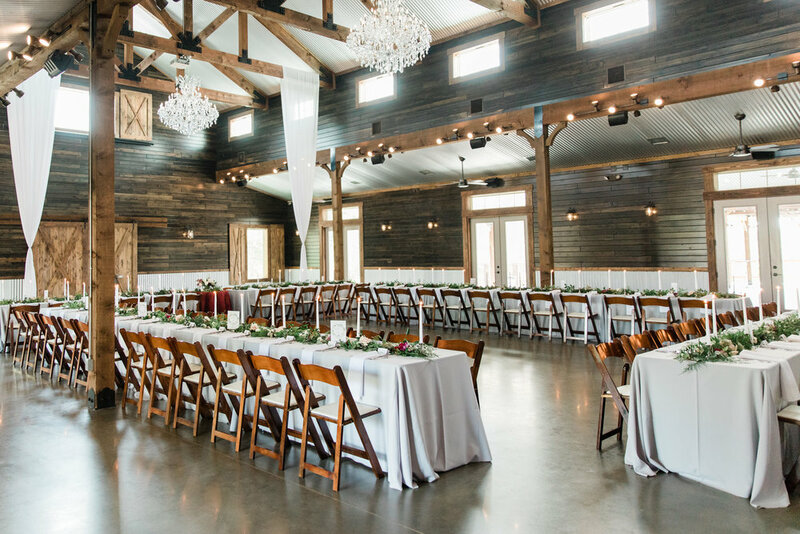 If you’re sitting there nodding your head, telling yourself you want to plan the stress-free wedding of your dreams, then we would LOVE to give you a tour of Peach Creek Ranch! We’re here to take your wedding day and make it a wedding getaway that you’ll never forget. To get in touch and schedule a complimentary tour, you can submit the form below or email us directly at admin@peachcreekranch.com! We can’t wait to help you plan the wedding of your dreams.